Are you team slim or oversized watch? I used to be a team slim but ever since I saw bulky watches turning out to be more fashionable nowadays, I'm actually leaning on to the bulky watches but of course, the "bulkiness" has its limits! Though I'm not a petite person, my wrist and hands are almost the same as a petite person (okay, that's too much information) but you get the drift when it comes to me choosing my watches! And let's not forget the fact that I'm born with a dad who loves watches dearly, I got his watch-loving genes so I am very particular in investing on watches that I like and making sure I can use them on various occasions! That's why when it comes to watches ranging Php15,000 above, I make sure I can wear them as often as I can and choosing an oversized watch may be cute but may not work for formal events! That's when TW Steel, the Big in Oversized Watches company says: "Why Not Both?" I knew about TW Steel years ago when I visited their Podium Boutique. I was searching for a nice, not so overly expensive watch as a gift for my brother. As much as I would love to give him TW Steel, the slim line aren't available back then and my brother has small wrist as well and prefers slim watches! Finally, this Dutch Brand created a Slim Line range which comprised of 10 executions, available only in 45mm dimension with the choice of steel or A-grade PVD rose gold plated cases. And of course, the beauty is not only on the exterior but TW Steel is a beauty inside as well! All models utilize a Miyota 1S13 slim movement! All models of the Slim Line Collection are embellished with sapphire crystals. are presented with steel bracelets resplendent in A-Grade PVD rose gold plating. To summarize the Slim Line Collection, they are all 5 ATM Water Resistant with 6 leather strap, 2 stainless steel and 2 PVD Rose Gold Plating, that comprises the Slim Line Editions. Photo below is not part of the slim collection. This is the Automatic Collection which is also new and available in the local market. Now back to the event, Issa Litton gave a wonderful job hosting the event and she introduced to media the three personalities in the social scene who have successfully balanced a multifaceted life. Sebastian Ripoll - a former University of the Philippines football player. Ripoll pursued his love of sports by finishing with a sports science degree from UP and went to teach. He is now the strength and conditioning coach and a consultant for the Department of Education. Adding to his impressive resume in his ongoing project with fellow producers Piolo Pascual and Gerald Anderson, the documentary series Team U.
James Younghusband - A household name for several years. You have seen him on pages of glossy magazines, billboards and of course, televised football games when he's leading the Philippine Azkals to victory. Nico Bolzico - a successful and well-traveled economist, also a Polo Aficionado. All 3 endorsers lead very vibrant lives and are committed to not only living out their dreams but also making sure they share what they have with others which embody the qualities that the Slim Line Collection espouses. That is, no either or, but simply, a delicate balancing act! And of course, the cap off this wonderful launch, we were all treated with unique dishes from Black Sheep. So unique each dish strike up conversation between us! and if you think this looks like a scoop of ice cream, indeed it is plainly Longganisa Ice Cream! Okay, this dessert, I was told, tastes exactly like cigar! I'm not into smoking so I gave this a skip! 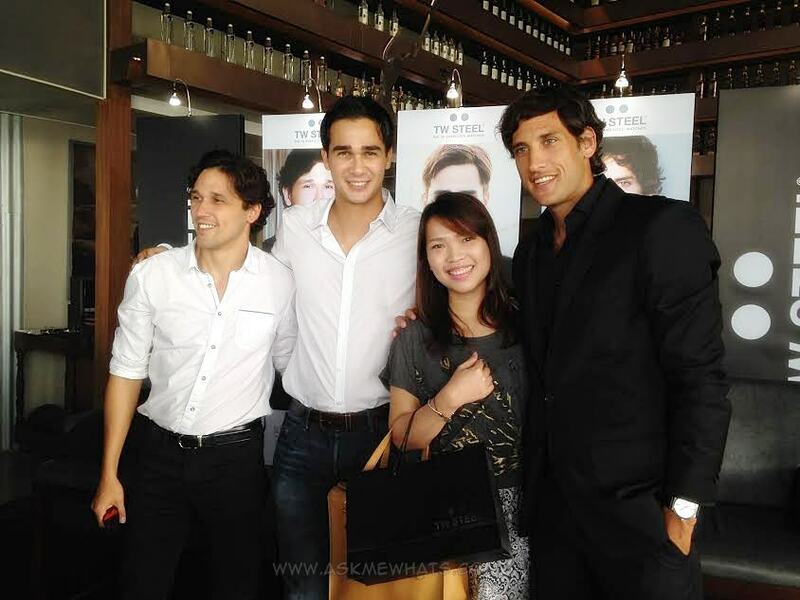 AMW and the gorgeous endorsers! TW Steel is available at the following TW Steel Boutiques (The Podium, Marquee Mall, Shangri-la Plaza, SM Mega Fashion Hall, SM Aura Premier, Century City Mall, SM City North Edsa), Lucerne, Chronos, Swissgear, WristPod, Adora and Le Temps. Are you into slim or oversized watches? I am into oversized watches because I find it cool to wear even in a Corporate Attire. I love MK and I have two G-shock watches. ooo I love MK and G-Shock! :) Good choices!